Casa Entera a 2 Min de Santa Fe. Property 59: Casa Entera a 2 Min de Santa Fe. Gorgeous apartment in Santa Fe "LA CHULADA"
Property 82: Gorgeous apartment in Santa Fe "LA CHULADA"
Suites Mar de Java: Hermosa Residencia Clásica ubicada, en la Ciudad de México..
Property 88: Suites Mar de Java: Hermosa Residencia Clásica ubicada, en la Ciudad de México..
My family decided on a Mexico City Christmas &quot;stay-cation&quot; in Coyoacan, where we found Jorge's home to be a perfect fit. 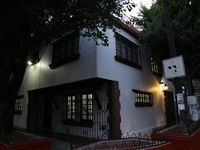 It's a beautiful, well appointed house that was convenient to everything we needed, including the Mercado Coyoacan and the Cineteca Nacional. Jorge met us upon our arrival to make sure we had everything we needed and to answer any questions about the house and the neighborhood. It was a wonderful place to have our family Christmas dinner. I would recommend Finca Coyoacan to anyone looking for a relaxing vacation in Mexico City.